The term “water use” can be misunderstood. In The Handbook of Water Use and Conservation, by Amy Vickers, defines two forms of water use: water withdrawal and consumptive water use. Consumptive water use in California rice systems is about 34”. This water is either evaporated or transpired by the rice crop. For California rice systems, average water withdrawal is 5 ft (60”) for rice. In rice systems this water is used for consumptive water use (34”) and the rest (26” on average) goes to percolation, seepage and tailwater spill. Seepage and tailwater spill return to surface waters where the water can be reused for irrigation or other purposes. Percolation water goes towards ground water recharge. The consumptive use of rice does not differ from many other field crops. However, water withdrawal is higher for rice than for most crops. In California, many rice producers like to maintain a continual flow of water through their fields (referred to as maintenance flow). This water helps maintain a uniform water height in the field and keeps salts from building up in the soil. 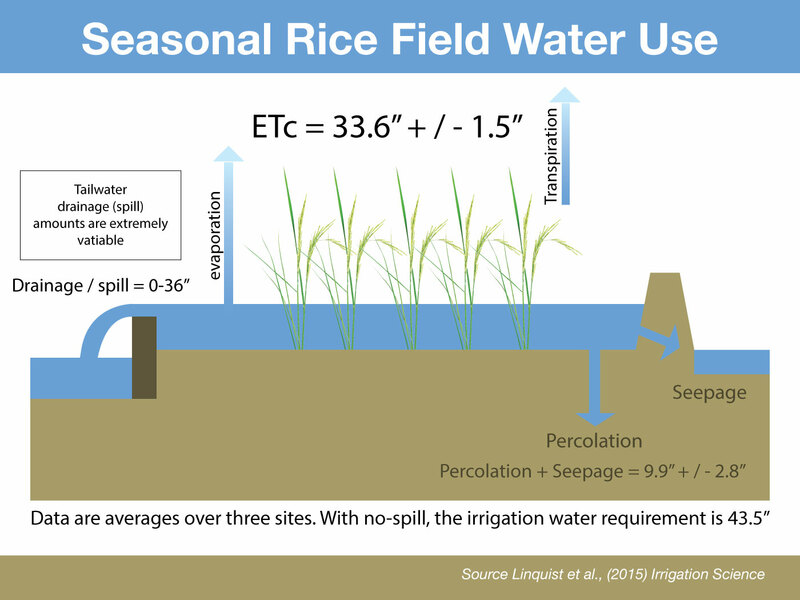 For most other crops in California, water is managed carefully to reduce tailwater, thus rice typically has higher water withdrawal compared to other crops. It is very difficult to make major changes to consumptive water use without significantly reducing yield. Some opportunities are to use shorter duration varieties which reduces the period that rice is actively growing and transpiring water. Another option is to plant later in the season. Planting later in the season means planting when it is warmer. This increases the rate of plant growth and development. These practices each have the potential to reduce consumptive water use by about 1”. Water withdrawal is easier to reduce. Rice producers can grow rice with no tailwater spill. This can be done if salinity is not a problem; however it does require increased attention to irrigation management in order to maintain the desire water levels in the field. Percolation is not usually a problem in the heavy clay soils that rice is often grown on. However, if fields do have high percolation rates, it may be wise to take these fields out of production. Seepage can be reduced by maintaining good levees around fields. More details on how to manage water when it is limited is coming later!